I came back from my trip to the Indian market at the South Bank with a bag of macaroons. I felt guilty after taking all these pictures of the market stalls without giving the sellers something, and the macaroons looked particularly irresistible, especially since I’d never eaten one before. Once I’d gotten them home, I couldn’t just eat them, could I? Such colour, such detail, I had to set them up and try my hand at photographing them. So, I got a plate, and set them up by the kitchen window. As is often the case, it’s difficult to get a sense of scale from this image. 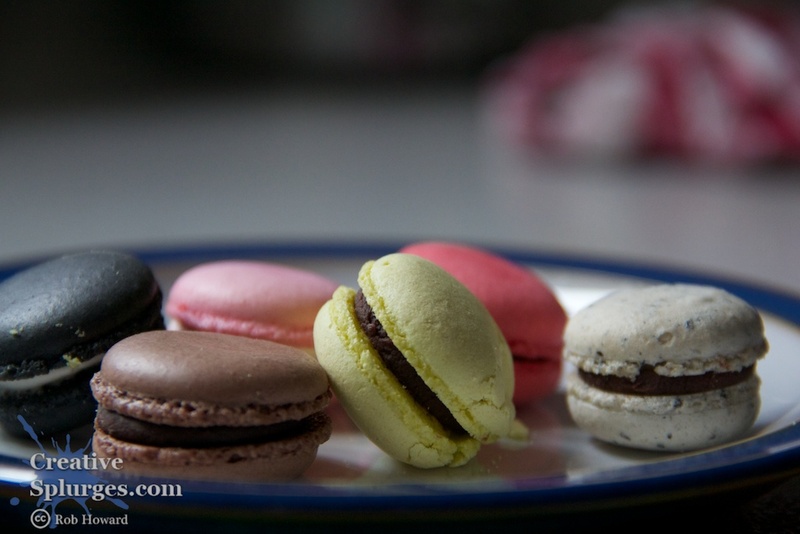 This is shot with my standard work-a-day lens, rather than my macro, but it’s still hard to tell how big the macaroons are (about three or four centimetres across, in fact – they were ‘mini’ macaroons). I love to shoot with natural, side-on light. Most of the time I do this with portraits, but it works on food too. After I took the photo above I noticed the damaged yellow macaroon in the foreground, so I reorganised them a bit, and then tried shooting with the light more to the rear. 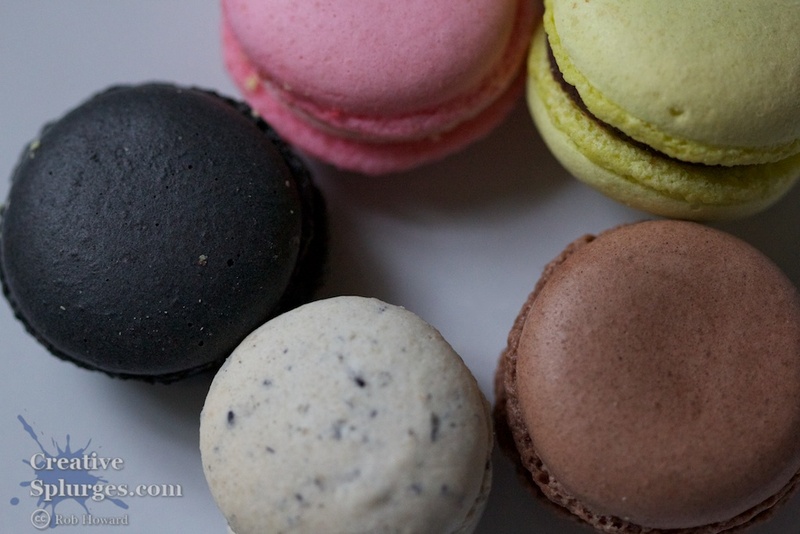 This was about as close as I could get to the macaroons with my standard 18-135mm lens, so I switched to my trusty, beloved (and coveted) macro lens in order to get a bit closer. 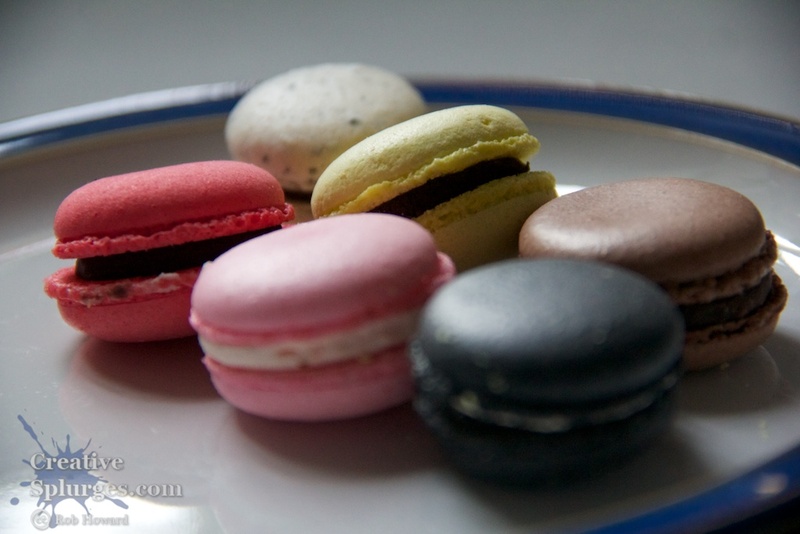 I then opened out the aperture to f/2.8 to give a narrower depth of field to help pick out individual macaroons. I also tried to play about with different angles. I was a bit disappointed with the specks of yellow macaroon that snuck onto the black one, but I like the circular pattern of the treats. I played about a bit more and took a few pictures I liked; the ones posted above are the best of them, but the rest are in the gallery below. Oh yes, and they were delicious. You should visit Larudee in Convent Garden, they have the BEST macaroons in London! hands down. I’ve been meaning to go to Covent Garden with my camera for a while, that gives me another excuse to try to get down there. Cheers for the tip! Great little photo project! I am horribly guilty of doing the odd thing like this on the spur of the moment, then forgetting and getting distracted by something else. 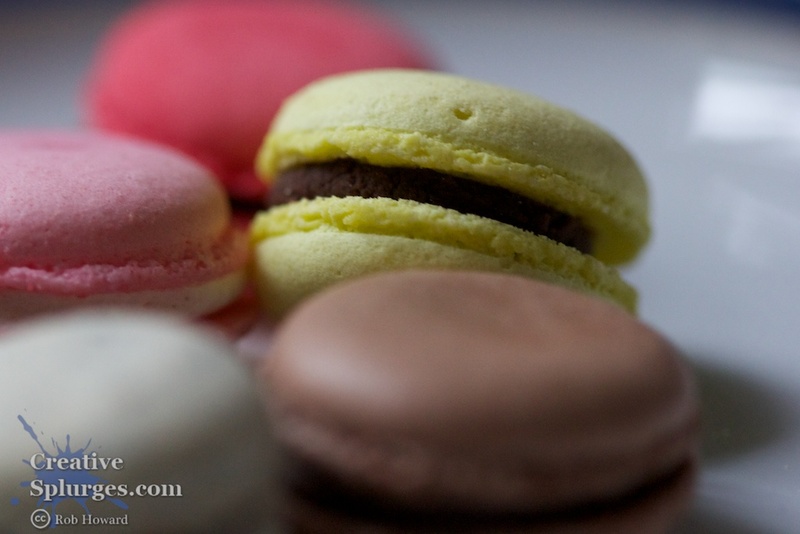 I have never had a macaroon. 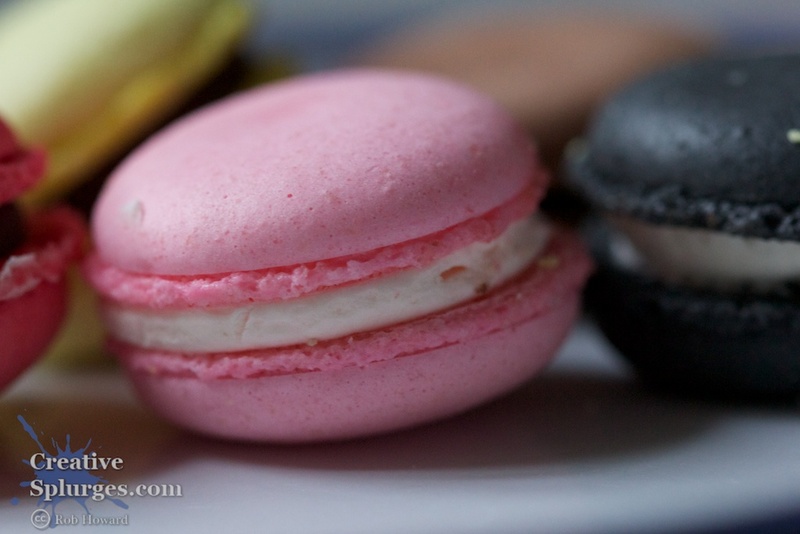 Until quite recently, I thought a macaroon was one of these: http://www.recipejunction.in/upload%5Crecipephotos%5C765107814525189coconut_macaroons2009-07-29-01-27-49.jpg Which we used to make at home quite a lot, and although nice, not really worth getting excited about. I am not sure when these other little delicious-looking things came about, but I really must try them. 3rd photo down is my favourite, by the way.